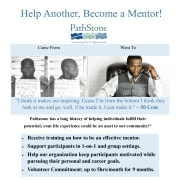 The PathStone "Training to Work" program helps to assist individuals who have had criminal justice involvement with their transition back to a self-sufficient life in the Rochester community. The mentoring component uses adult volunteers committed to supporting, guiding, and being a friend to our participants in support of this mission. By becoming a part of our mentor network, volunteers help participants through the process of setting, pursuing, and achieving positive career and personal goals. Work directly with participants in one-on-one and/or group sessions. Provide support to individuals facing multiple barriers to achieving personal and career goals. Be a positive role model in mental, physical, professional, and family wellness as appropriate. Communicate with mentees on a regular basis to track their progress and keep them engaged in their goal pursuit and program enrollment (in person, by phone, and/or electronically). Promote participant success by being a consistent advocate and helping participants as they build their capacity to utilize natural supports and other community resources. Keep track of mentor relationship using simple reporting logs. Communicate on a monthly basis with Mentor Coordinator in order to gather information relevant to programming and to report mentorship activities. Up to 5 hours per month for a minimum of 6 months. Monthly communication with Mentor Coordinator.